Twinhead returns to Eyedrum with a new spin on an old classic! 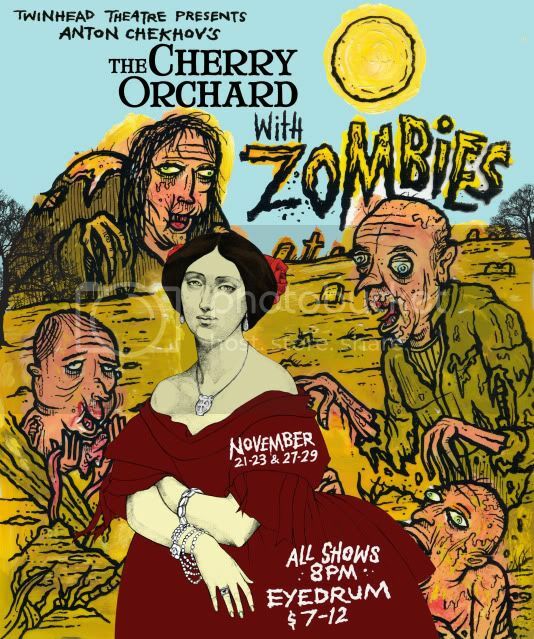 Given the recent trend of sticking the living dead into just about anything, Twinhead has decided to re-animate one of the finest Russian plays ever written, bringing you The Cherry Orchard with Zombies. Imagine a nation-wide mortgage crisis, a family trapped in insurmountable debt, an entrepreneur in a moral conundrum, a financial consultant who can't pay his own bills...sound painfully familiar? Ok, well now imagine that while trying to survive a vicious assault by flesh-eating zombies. Come see how it all ties together in Twinhead's first new show of our seventh exciting season!